Why should you learn the verb types? Many Finnish learners feel overwhelmed when they are faced with all the different rules concerning Finnish verbs. It can all be especially challenging for those who usually prefer learning languages in a highly communicative way, not paying too much attention to grammar or morphology. You can definitely learn to communicate in Finnish by just listening and talking, without looking at a single grammar book. Just keep in mind that you then should use every possible opportunity to speak Finnish and that you need to be very open to making mistakes and to the fact that your road to fluency will be based mainly on a lot of trial and error. You need to be able to tolerate not knowing if you got it right or wrong. Perhaps this article will shed light on what kind of things you might be up against no matter what your preferred way of learning is. When you feel like none of it is making sense, then remember this text. I'm sure this post will benefit anyone who is learning this surprisingly (and delightfully) logical language! Right, so I will presume here that you know what a verb is. 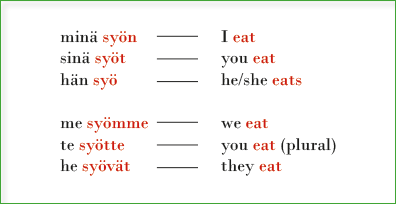 Verbs are conjugated when you use them in sentences, and it so happens that Finnish verbs take a different form with each of the personal pronouns (I, you, he/she etc.). In English, you normally have two choices (I write, he writes). This is something you can "get wrong" in Finnish and still be understood, which is nice. The effect will be similar to you saying he write in English, however, in Finnish you have more opportunities to make that mistake. But still, not a big deal if you're not worried about it yourself. The difficulties will start – no, actually I won't say difficulties. I'll say this in a more positive way. When you start to express yourself more or less fluently – with or without mistakes – then you'll want to say more complicated things. Instead of saying the Finnish equivalent of I need or I eat, you might want to say I would need or I would eat (the conditional/konditionaali). When I was learning English in school, I was taught there was this separate word would that you could add to the mix, and voilà, you had the conditional structure! In Finnish, there is no such word that is separate. Instead, you have to add letters to the verb, and you have to know to which part of the word you need to add them. I'll take the word laulaa (to sing) as an example. I added –isi– in the middle of the word, and those three letters do the same thing as would does in English. Pretty straightforward when you're dealing with an easy type 1 word such as laulaa. But what if it's type 2, like the verb syödä (to eat)? That was verb type 2. And if you learn the verb types in the beginning, you will learn that the way the conditional is formed with type 2 verbs (it may involve removing letters as you can see). If you haven't learnt the verb types, you'll probably spend a lot more time memorizing individual ways of forming constructions instead of seeing the logical side of it all. Looking at these tables as a beginner, you might think that it makes no sense, but anyone who has learnt the patterns involved once will probably say "aah, right, of course, it's type 2". And then they move on to learning the conditional, probably accepting the fact that they'll be able to learn more and more advanced constructions faster, thanks to the set of rules they learned and practiced early on. I hope this helps you to get an idea of the sort of dimensions Finnish verbs can have. I know the value of understanding the basics of the verb types, which is why I've created an online course called the Finnish Verb Types. The course consists of videos and exercises which will guide you through the verb types step-by-step. You'll finish the course with great basic knowledge of the verb types and lots of useful everyday vocabulary. I hope to see you there! Ps. If you know anyone who is learning Finnish and might find this useful, please feel free to share this post with them!